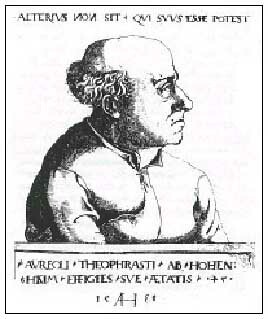 Hand Reading Mini-Course - HISTORY: Paracelsus used the hand & Purkinje's fingerprint system! Paracelsus used hands for disease + Purkinje's fingerprint classification system! Preceding the 19th century no developments have taken place which are relevant in the perspective of modern handanalysis. For till the 19th century the practitioners of handanalysis (palmistry- or palm readers) merely focussed on its profetic aspects. "... Paracelsus used the stars of heaven to predict the future and he used the human hand for indications of diseases..."
Figure A-1: Portret of Paracelsus: an engraving created by Hirshvogel in 1538. The latin words op top of the engraving describe Paracelsus' motto for life: "Let no man belong who can belong to himself belong to another". Figure A-2: Purkinje's fingerprint classification systeem. The very first fingerprint classification system was presented in 1823. It was the work of Joannes Evangelista Purkinje(2) - a Tsjech physiologist. 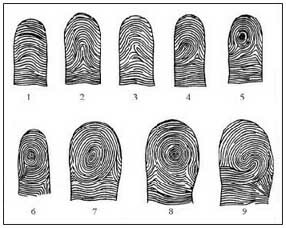 Purkinje's system describes the variations among 9 fingerprint types. Only a few years later, in 1833 the anatomist Bell2 described the funtionality of the dermatoglyphs: "these give us a firmer grip". 1 - Gettings, F. The Book of the hand: an illustrated history of palmistry. (p.161). London: Paul Hamlyn Ltd. 1965.